The basic premise behind his technology (sometimes called “Pepper’s Ghost“) is simple. It’s just a sheet of semi-mirrored glass angled at 45 degrees to a display. In this case, the display is an iPad. Light from the iPad’s screen will bounce off the glass sheet and be projected forward joined with light shining through from behind the sheet. This showcases whatever is presented on the iPad’s screen as a semi-transparent ghostly image. That’s not anything too terribly awe-inspiring, and $44 isn’t too much to ask for a well made gadget like this. Unfortunately, the claims would have you believe that it can do a whole lot more. If you’ve ever worked in the broadcasting industry, this thing might look a lot like a teleprompter. A teleprompter is a device used to deliver cues to actors and anchors without diverting their attention from a camera. This is achieved by similarly using a piece of half-mirrored glass. Scrolling text on a screen projects down onto the glass and reflects towards the actors while a camera stationed behind the glass can see the actors unobstructed. The premise is that by looking straight at the camera, the actors can see the text and read their cues while the camera doesn’t see anything out of the ordinary. So cool! 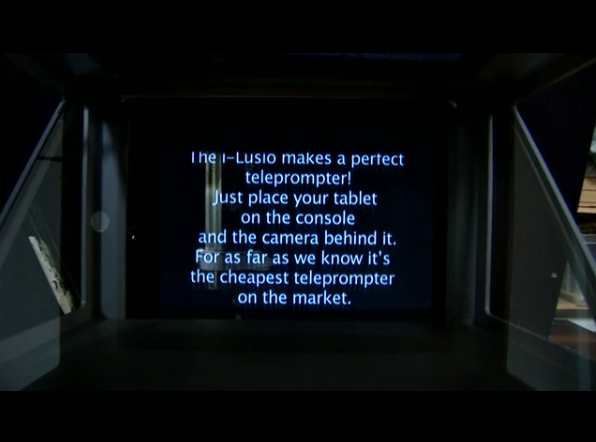 A $44 teleprompter that only needs your iPad to function. But remember, the basic premise of a teleprompter is that the camera behind the glass can’t see what’s on the glass. If that’s the case with i-Lusio, what exactly is this fella looking at? If we’re to believe that this device is indeed a teleprompter and pretend for a moment that our friend here is a video camera, we have to also believe that he has no idea what it is he’s pretending to grab because he can’t see it. They would have you believe that it’s a true 3D representation when in fact it can only be viewed from the front. I wonder if there’s an outtake where our dutch buddy here is unwittingly groping something a little inappropriate for the final cut. Would have been a great prank. Wow that’s amazing! It’s like the virtual creatures are really interacting with real world objects! 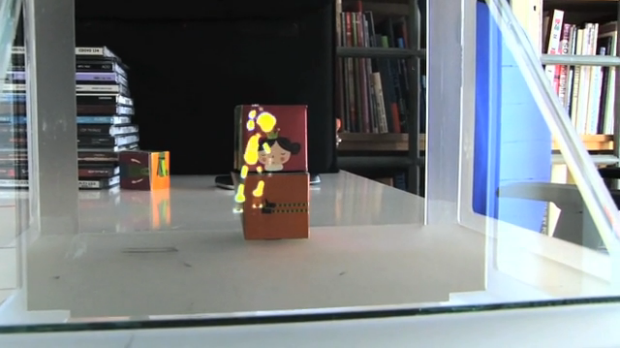 For a system like this to work, the device generating the virtual images would simply need to have some way to identify where the physical objects are located in 3D space and then position the models on the screen to appear to clamber over/around them. Perhaps this could be done with some kind of sophisticated algorithm on a specialized app using the iPad’s camera. This might be a little difficult though given that the iPad’s camera isn’t located in the most convenient location, oh, and that the first gen iPad pictured in many of the demonstrations doesn’t even have a camera. The content player app makes it very easy to interact with the iPad. By simple commands touching the screen anywhere ones, twice, short or long it’s possible to interact with the program. So it has a special app that makes it easy to skip to the next animation using a simple tap on the screen which is much easier than navigating menus on an upturned iPad. But what about locating blocks of paper or dollhouse doors? The animations demonstrating this “feature” are likely designed specifically for the demonstrations shown in this video. With any other configuration of blocks or doors, the animations would simply make no sense. 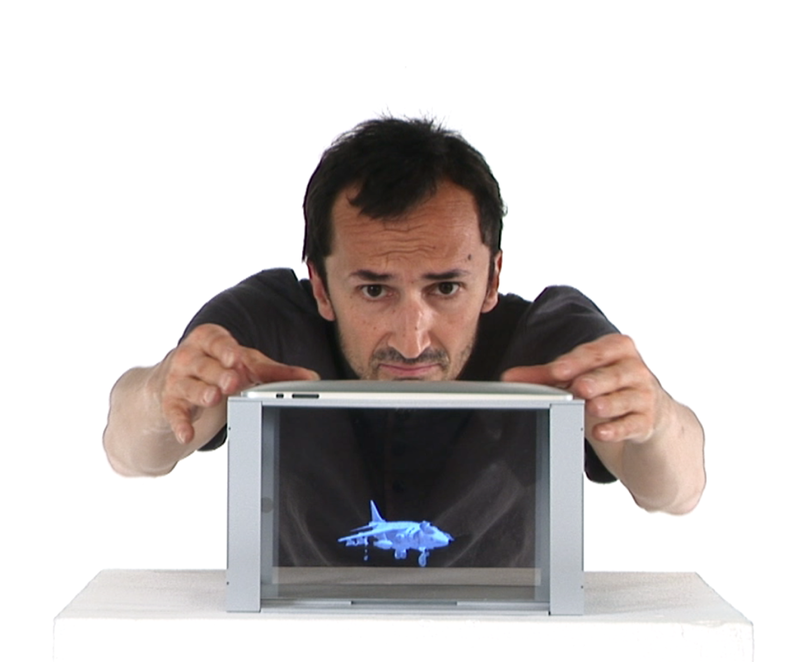 Okay, so it’s not an interactive hologram, but it’s at least a hologram right? I guess I’m among the “few” in this case. 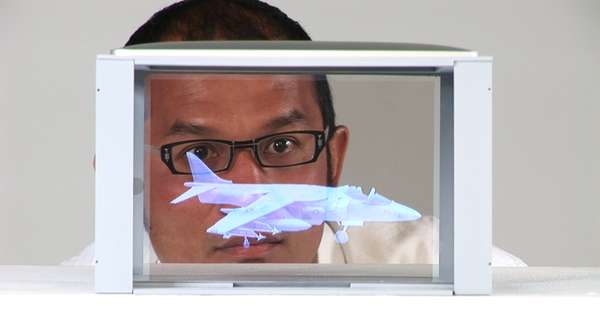 There are many methods for creating a 3D illusion such as special glasses that show a different image to each eye or a parallax technique that uses information about the viewer’s perspective and leverages it to approximate a 3D image as the viewer moves around. The former is used in 3D movies, and the latter has been used most recently in iOS7’s home screen or perhaps best used with this Nintendo Wii hack. 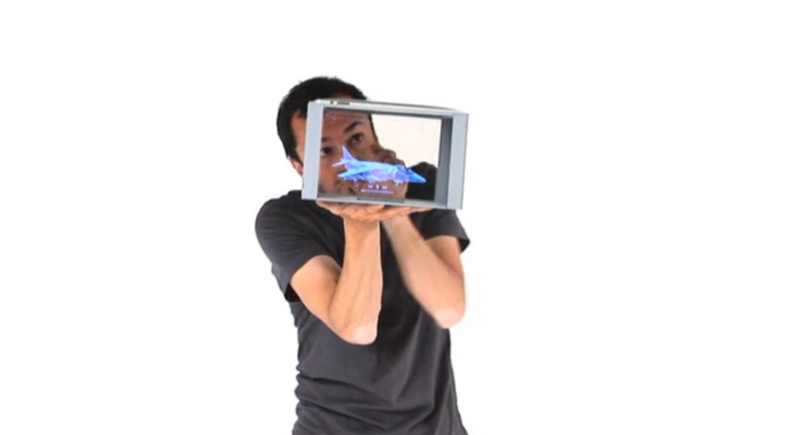 i-Lusio claims that it has “NO special glasses required!”, so it can’t be doing the former, and the latter would require some kind of camera or sensor to approximate where the viewer is located, and we’ve already established that the iPad has a very limited number of relevant inputs. You might notice in a number of the videos that the cameraman is very careful to only move towards and away from the target and not side to side. 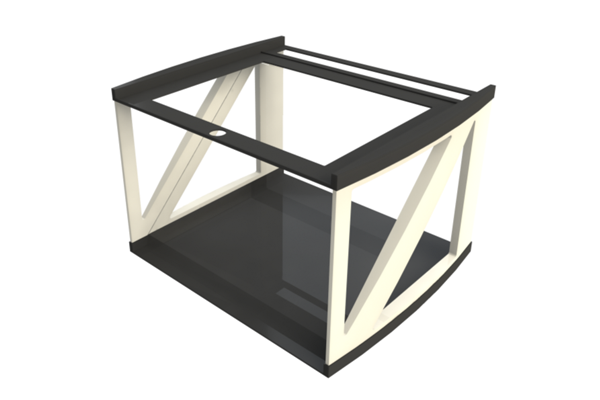 Unless the motion was planned very carefully, moving side to side would readily demonstrate that the object shown in “3D” is not anchored to the real-life table. 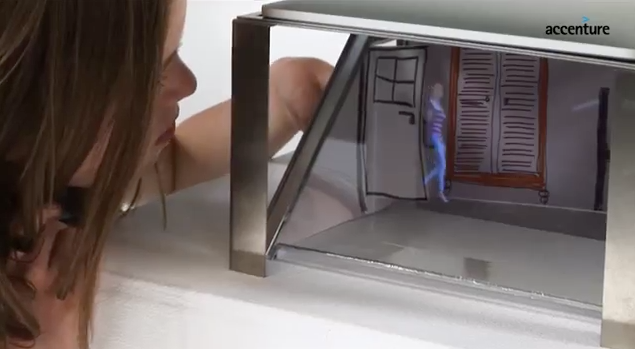 It will move around as the viewer’s perspective changes. This is because optically speaking the object is located behind where is purports to be. I imagine that the girl pictured here thinks she has the character between her hands, but simply moving the perspective of the viewer has changed the location of the character. This is no more “3D” than a typical computer monitor. Alright, I think I’ve harped on this thing enough. I can totally believe that $44 can buy a well designed iPad case and sheet of glass, but any implications that this device can actually deliver on its claims is purely i-Lusory. This entry was posted on Monday, September 23rd, 2013 at 10:27 pm by ch00f	and is filed under Indiegogo Campaigns. You can follow any comments to this entry through the RSS 2.0 feed. You can leave a comment, or trackback. i – OS devices including the i – Pad, i – Phone, and i – Pod Touch. Ipad especially at the corners.